Quick pickled red onions are something that came into my life only within the past couple of years. Now, I'm kind of addicted to their sweet and vinegary crunch whenever we are having tacos, burritos, etc. I love their hot pink color and have found that they add a wonderful brightness to meat-heavy dishes like these fabulous carnitas. I like to make chicken tacos topped with these onions, avocado, sour cream, cilantro, and a squeeze of fresh lime juice. 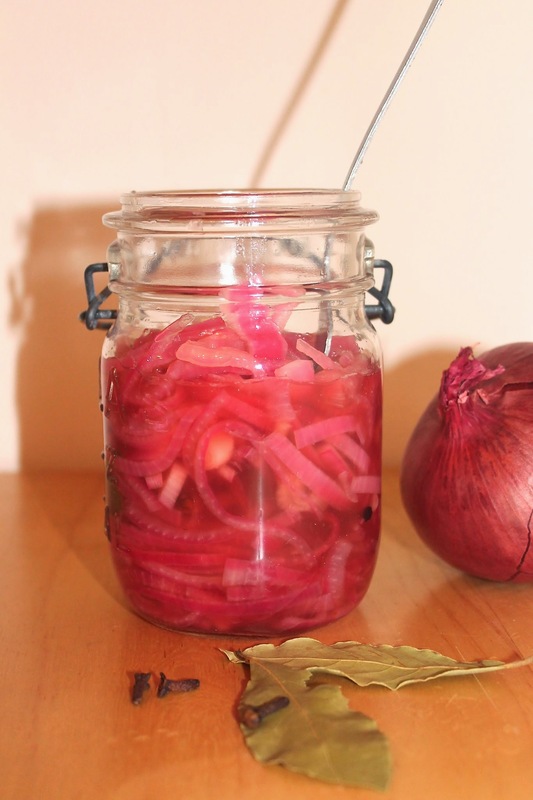 People make pickled red onions with different spices and vinegars - there's not one right way to make them, in my opinion. This recipe is how I have found that we like them best and I'm surprised that I haven't shared them on the blog before now. I like to make them the day before so they are cold and crunchy against warm taco toppings, but sometimes I forget and make them at the last minute and we eat them still warm.... that's okay, too. Just as long as you make some. Family recipes are always special. 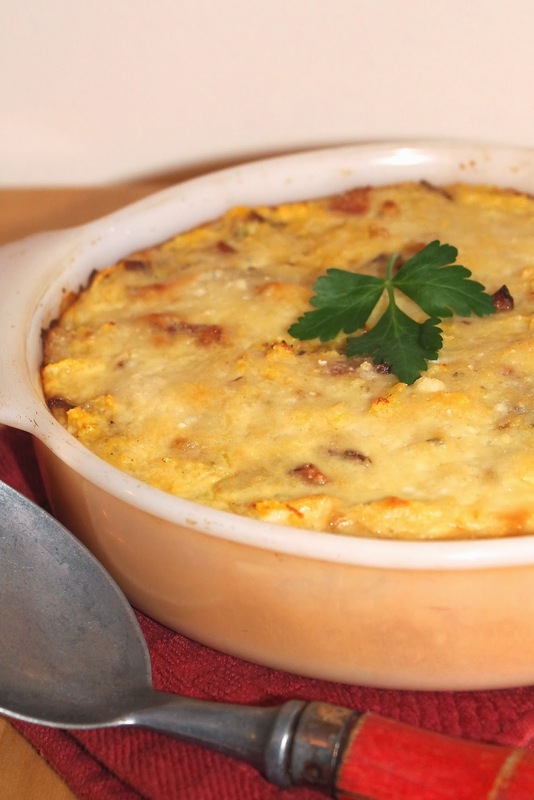 This recipe come from my husband's paternal grandmother. I've heard many stories about what a wonderful baker she was. Unfortunately, I was not ever able to try any of her baking as she was no longer able to bake when I came into the picture. She passed away last year. This is the first recipe of hers that I've tried. Luckily, she wrote down a lot of her recipes so they can be shared and passed on with others. Plus, making recipes from your family brings back memories and stories you can share. 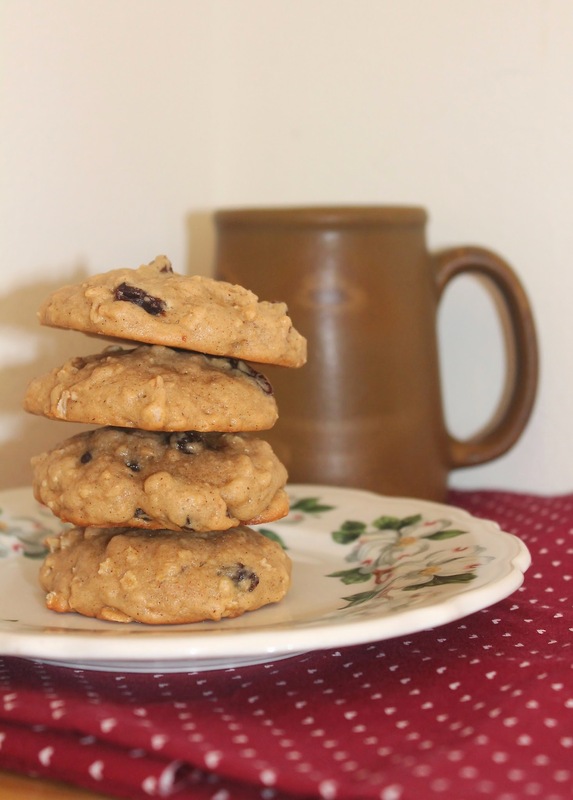 This recipe made my favorite kind of oatmeal raisin cookies - soft, fluffy, and moist. The only things I changed from Grandma's recipe was that I used butter instead of shortening (we all know that we don't eat shortening around here) and I did cut down the sugar a touch. This recipe makes a lot of cookies. There was no yield written on the recipe, but I ended up with about 3-1/2 dozen cookies. I didn't grow up eating carbonara, so I had never tried it until I made a penne and asparagus version last year. This recipe is based on that one, just with different pasta and a different vegetable. 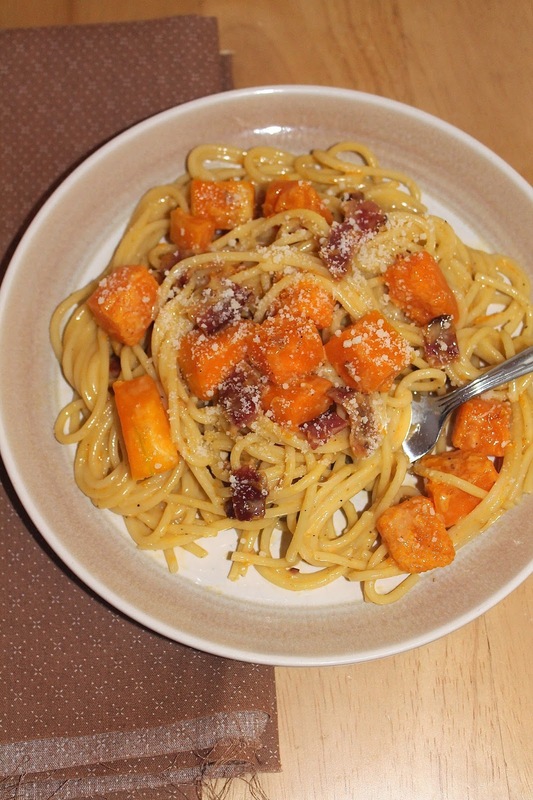 This carbonara was a wonderful use of butternut squash. The sweetness of butternut squash pairs really perfectly with the salty bacon and creamy egg and cheese sauce. To top it all off, we had just brought home pastured eggs from a local farm that day and we had some delicious local pastured bacon. This really takes this dish of simple ingredients over the top. We have been slowly eating our way through our stash of winter squash and we are almost to the end. There are only about three left from our two crates we had put in the basement last fall. We have enjoyed them a lot, but now I'm beginning to look forward to spring vegetables! Does everyone remember the brightly colored sherbet that comes in orange, strawberry, lime, and probably other flavors? I was never a fan as a kid (I much preferred ice cream). I hadn't had sherbet in many years. After a bit of reading, I figured out that sherbet is made from fruit juice with a bit of dairy to make it creamy (unlike a sorbet, which is all fruit juice). 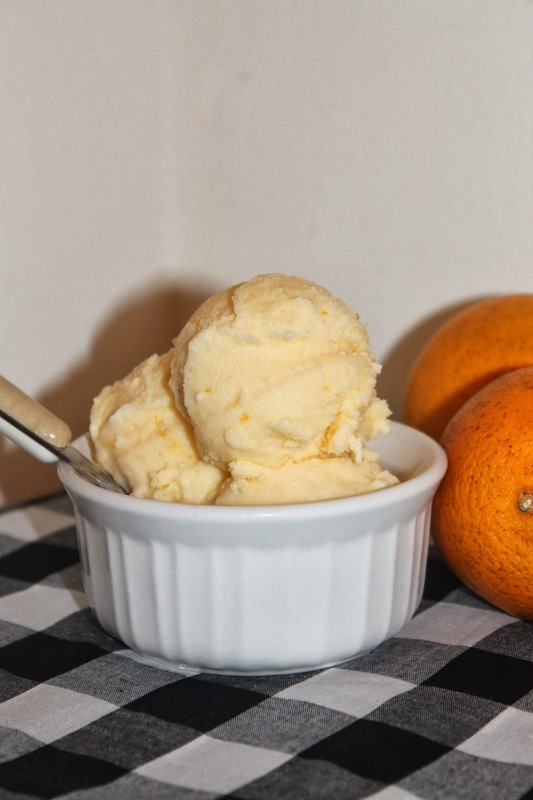 We got our second bag of fresh organic oranges from Thorpe's Organic Family Farm and for some reason making a sherbet sounded like a great idea! It's really simple in ingredients, but the flavor, especially using these fresh oranges, is so bright and really makes your tongue dance. It must have been the warm-up to above freezing that put me in the mood to make a frozen treat (although as I write this, a blizzard warning has been issued for tomorrow). If you've never made sherbet before, I recommend giving it a try - it's really delicious and made with ingredients you can recognize! This recipe was inspired by a recent post on The Kitchn; however, I changed it up quite a lot. I used the world's most amazing bacon from the half pig when purchased this year. Seriously, this is the smokiest, most delicious bacon I've ever had. I also used a couple of farm fresh eggs. This is a dish that could really be served at any meal. 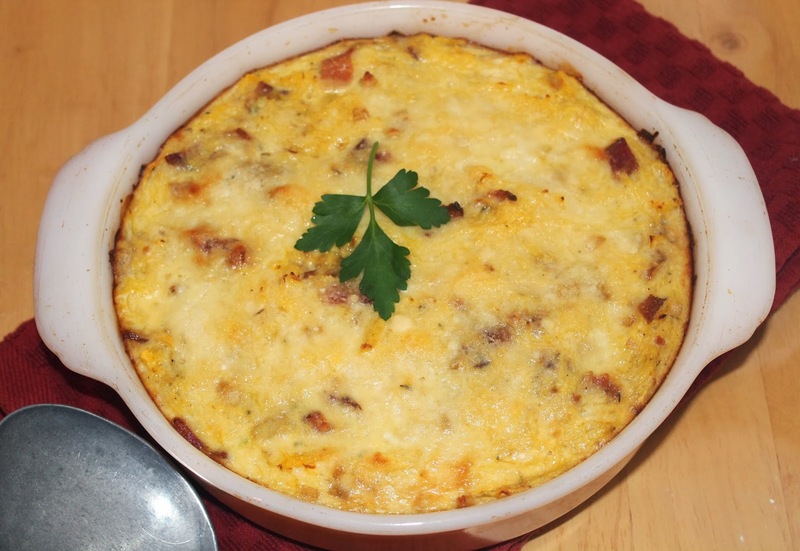 We had it for dinner with a side of broccoli, but I think it would be great for lunch or brunch as well because of the eggs and bacon in it. It would be a complete meal with a simple salad. This recipe will make about 4 main dish servings. I've been slacking a little bit lately on posts... not because I haven't been cooking, but I haven't been making a lot of new stuff and sometimes even when I do, I just haven't been in the mood to take photos of it... But, I have some new things coming up that I'm excited to try, so hopefully I'll be posting more frequently again very soon!